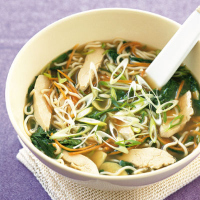 An aromatic and refreshing low-fat Japanese-style soup that is ready in 20 minutes. Ideal for a quick lunch or supper. Place the stock, 500ml boiling water, miso soup paste and ginger in a medium saucepan. Bring to the boil, then simmer for 3-4 minutes. Add the carrot and half the salad onions and simmer for 2-3 minutes. Stir in the chicken and spinach and cook for a further 2-3 minutes. Stir in the noodles, return to the boil and simmer for 1-2 minutes until thoroughly heated through. Ladle into large bowls and serve immediately, garnished with the remaining salad onions. Try adding 200g cooked prawns instead of chicken. Add them at Step 3, heating through thoroughly with the noodles. You could also substitute the spinach for a 200g pack green pak choi, washed and chopped.